This was never going to be one of the main songs on the album. It was only ever filler, a random demo that sort of fit in thematically that I decided to throw in to fill space. Not a big a deal, not a great song, and okay one that I wrote in five minutes. I’d probably find something to replace it with later. And yet, as it turned out, Set Light to the Sky is one of the best songs on the album, in my not entirely humble opinion. Thematically this song continues the story straight after Fire Flower Heart. Our protagonist’s lover is dead and the gloves are off. How does he react to that? Yes, that’s right, it’s a singalong anthem about mass-murder. Our protagonist has decided that with his lover dead there’s littl point to holding back or being cautious. He finds as many explosives as he can, places them where they will do the most damage to the oppressive regime and sets them alight. Can you can hear, the main difference apart from the much better playing on the final version, is the coda. The end of the studio version is much more developed than the demo version. This is a change that Jordan suggested, and to be honest it transformed the song. I had thought of this as a throwaway song. It had been written very quickly indeed for February album writing month a few years previously in an attempt to get my song total up. So it had very little thought it into it at all. It’s based on a chord progression based on a standard, but with a tiny little twist. G D/F# Em C would be the standard. I changed that to G D/F# Em Ebmaj7. The Eb chord is out of key, but it shares a G and D note with the main key, giving it just enough of a relationship to G to be interesting but not quite what you’d expect. The rest of the song is based on this progression, with the verses arpeggiated versions of the chords with a C# thrown in for another bit of contrast and the pre-choruses doing something similar but starting on C. The bridge makes use of the Ebmaj7 as a cue to changekey properly, so the bridge and solo section are in Cm. And what does all this theory stuff mean? it means I thought my way to this song – it was an exerise in craft that I thought was fine but not inspiring. I threw the demo into the mix because I felt I needed another song and this one would do until I thought of something better. I definitely feel like it’s too short. i wouldn’t repeat the chorus again, though. Maybe have another section as a coda? If you want it to be short and sweet then I’d suggest working on the order of the parts and giving it a more traditional structure. My feeling, so far is that there’s more weight to the first two minutes than the rest of the song. And I did what he said by extending the solo and coda with a load of extra guitar layers and suddenly we had a proper album. Just sorting out the balance and pacing of the thing transformed Set Light to the Sky into the album’s big singalong anthem. Add in Jordan’s bass playing and great string arragenments and Dan’s inspired production – I particularly like what he’s done with production on my voice in this – and you have one of the central songs on the album. 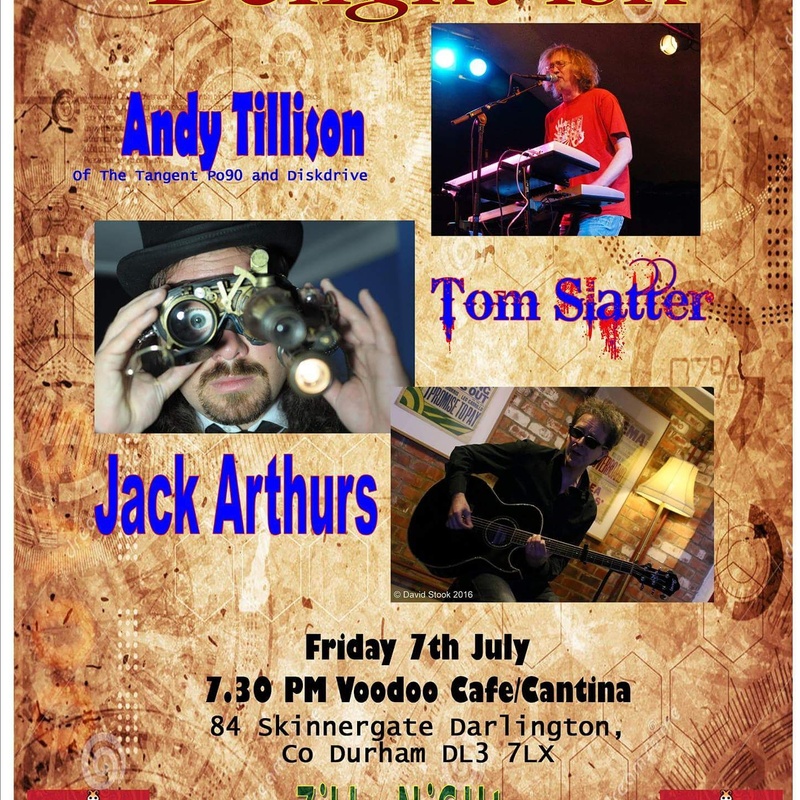 7th July at the Voodoo Cafe in Darlington! “Three acts and three very different styles of music to suit all tastes in the great line up. Jack Arthurs returns to Darlington with his brand of singer song writing. His last album Treasure House was well received across the media. His music reflects his experiences of the north east and it’s amazing countryside. He follows in the fine tradition of folk rock and has been compared with Alan Hull of Lindisfarne ‘s solo material. 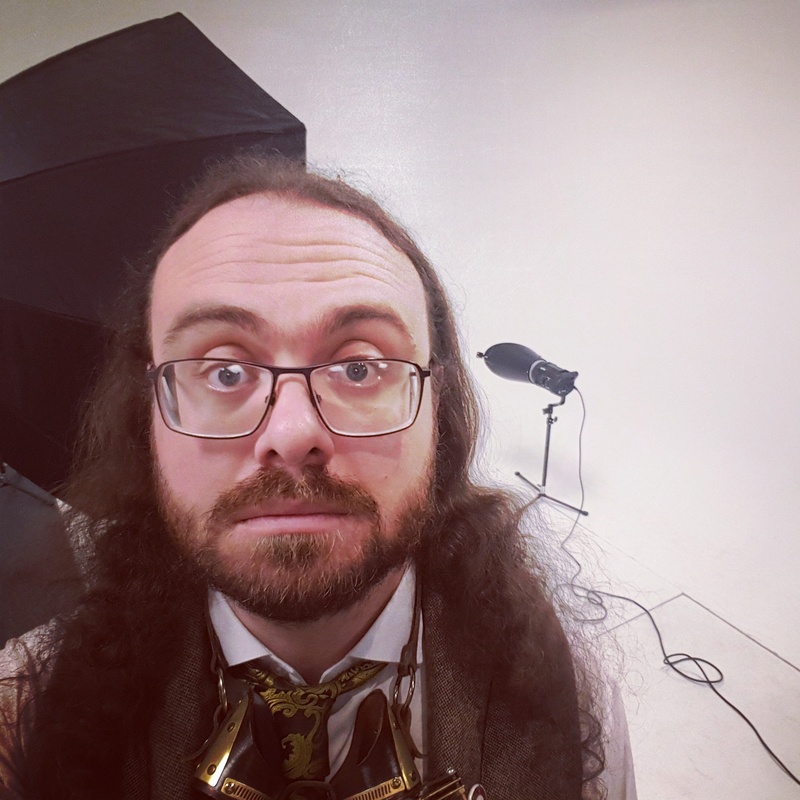 Tom Slatter Steampunk Troubadour on has just released his fifth album “Happy People” to great acclaim like Jack he is on Bad Elephant Music . He is a regular on the Steampunk scene and has to be seen to be believed. Andy Tillison the keyboard player and main man with The Tangent as well as projects like Po90 and Diskdrive have placed him as a stalwart of the centre modern progressive rock music. Never one to be pigeonholed his projects contain Jazz, Classical, Electronica and funk to name a few. This is a rare opportunity to see him perform a solo set in as acoustic a way as any keyboard player can be said to be acoustic. He is about to embark on a European tour with The Tangent and Karmakanic in August to promote “The Slow Rust Of Forgotten Machinery” which is released in July 2017. After writing the behemoth Seven Bells Redeemed I joked that I needed to write a riff 25 for every album. Turns out that wasn’t a joke after all. All right, it has some twisty rhythms in it, but this song was one of the most organically composed on the album. The music was pretty much one sitting – somewhere I have an acoustic sketch of it with me humming the melody but getting the music pretty much spot on. Recording it was interesting. I think of these kind of rhythms as additive – I count the smallest sensible unit, in this case the semi-quavers (sixteenth to any weirdos/Americans listening). it therefore seemed sensible to record to a click track of these, and not bother working out all the time signatures. What became apparent when we were recording the vocals however was that Dan and Jordan were counting the riff completely differently, to the point where we didn’t agree where the downbeats were. Which was weird. Jordan had suggested changing one of the verse vocal lines slightly and we spent what seemed like hours trying to get an alternative right, which was totally scuppered by the fact that we were hearing the rhythm wrong. In the end I took an executive decision and we stuck with the verse as originally written, but the rhythms did throw us for a time. We got there in the end, thanks in large part to Michael’s one take drum part. yes that’s right, Michael played the most difficult piece on the album in one take. I still can’t get over that. Love the riff! Almost Tool – esque. Somehow the flow of the second verse (vocals) is ever so slightly more fluid than the first one (It’s probably a question of number of syllables, haven’t investigated closely yet). Lovely interlude after the second chorus with a nice modulation. It seems to me that the transition between the verse and the chorus is a bit abrupt. Is there a way to make it more flowing? maybe a short transitional part? As you can hear, for this song I pretty much ignored all his advice. There is whistling in the song. It was not planned. I was just whistling along in the studio, as I tend to do, and Dan decided we should record it. I thought this was a barmy idea, but in creative things you don’t say no (at least not until you’ve heard the idea). He was right. I really like the middle section to this song, with the backing vocals courtesy of Dan and Suzette and the guitar counter melody. Another thing I said yes to was trying a load of vocal ad libs. They did not make it through to the album. I’m not much of a vocal improviser anyway, I much prefer having a written part and really dislike gospel-style adlibs, but the verses of this song are a bit choral in nature. After several attempts though, that was an idea we sensibly ditched. What is left is one of the rockier tracks on the album. The lyrics were written back in 2014/15 well before the current political climate had developed and I had no intention of writing something allegorical. Any similarity between the people in this song and the sort of scared people currently voting for authoritarian politicians in various places around the world is entirely coincidental.